I'm closer to 40 than I am to 30 — not that you can go backwards — but I totally think that 18-year-old Taylor Lautner is hot. Is it okay for a grown woman to have a teenage crush? In today's Daily Mail, 49-year-old Diana Appleyard says: Yep! She likes young, Romeo + Juliet-era Leonardo DiCaprio, and thinks 31-year-old James McAvoy "has that perfect blend of gorgeousness (but not too-pretty boy), cheekiness, sexiness (oh, yes), and an underlying hint of ­working-class anger that is, for some ­reason, devilishly attractive." This is not about being a cougar — Appleyard's crushes are just that: Crushes. Fantasies. Not relationships with anyone she knows. Just the acknowledgment that she finds some of the young male stars — in entertainment geared toward her two teenage daughters — hot. Appleyard explains she's not interested in grey-haired men like George Clooney, writing: "I have one of those at home." If Appleyard were a man talking about having crushes on younger women, would we be grossed out? Propabably. But she's not having a mid-life crisis; she's not advocating ditching the husband for a sports car and the younger guy who lives down the street. She's just sharing her daydreams. Remembering what it was like to be a fan, to live in that sliver of girlworld where cute rules — while still going about a normal, adult life. Which sounds healthy, escapist, and enjoyable. …It's fun. That's what crushes are all about. They are designed to take you out of your boring old life and catapult you into a world where you actually meet your hero. 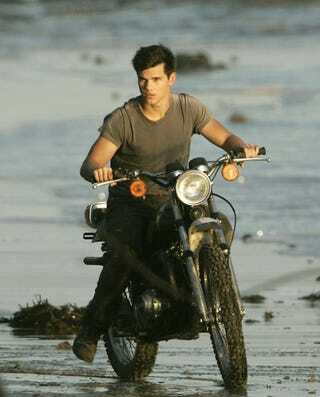 So if you'll excuse me, I'll be speeding down the beach on the back of Taylor's motorcycle for the next 10 minutes. BRB. Earlier: Underage Stars: Is There A Sexual Double-Standard? Hell Yeah! Underage Stars: Is There A Sexual Double Standard? Hell Yeah!